There’s good news and bad news! First the good news. Your company is growing at a significant rate of knots – the bottom line looks great and you have loads of happy customers. The bad news is your people are practically sitting on top of each other in your current office and negotiating desks, people and equipment to get to the coffee machine is becoming a mission. So, now’s the time to make the big move. Assuming you’ve already got your new premises all lined up, the first step is to have a well thought-out plan of action that will create as little disturbance to your productivity as possible, which could ultimately affect your bottom line. A good rule of thumb is to start planning your move 4-6 months before D-Day (or rather M-Day)..
Get quotes on costs and set a budget. Next, set the date and book your removalist. Bearing in mind that most people are nervous about change it’s important to keep your staff in the picture by communicating the details of your office move as you go along. Treat your move as you would any other project your company would undertake and use your resources – rope in staff to help with everything that needs to be done. Depending on the size of your company, it would be a good idea to appoint a project leader in each department to make sure everything runs smoothly. Moving office comes with its own set of challenges and a good checklist is crucial to make sure all your bases are covered. Your office move not only impacts on your own company, but if you’re in an office park or block it could disrupt other businesses in the building. For starters, find out if there are any restrictions on moving in or out from the building managers. Remember moving office is a two-step process – so clarify the building regulations at both your new and old premises. Find out whether you can move during office hours. Some building management company’s don’t allow office moves during normal business times due to the disruption factor and inconvenience to other tenants. The best thing to do is to establish what the rules are, and coordinate well in advance with your removalist company if you have to plan an after-hours move. Also find out from your removalist if there are any additional charges involved if you plan to move at night or over the weekend. If you’re in a multi-storey building, find out from the building managers whether you need to book the goods lift for your office move, and how far in advance the booking needs to be done at both ends of your move. Also get information on how many lifts you can use as well as if you have exclusive use, these are things your removalist will want to know. Investigate whether your current or future building has a loading dock. You’ll need to let your removalist know its height so that they can organise the right truck size for the move. If the loading dock is accessible through an underground garage, find out the clearance restriction and let your removalist know this too. Ask how far in advance you need to book the loading dock, if at all. Either (or both) your current or new building could be access controlled, therefore the management company may require details about the removalist team (company name and contact number) in order to issue passes or key cards. In most cases, your removalist company will also have to produce their public liability and workers compensation certificates to satisfy the building management. Something else required from your removalist is a Safe Work Method Statement (SWMS). This is legislative paperwork which outlines the safety steps, main hazards, risks and controls associated with removing heavy objects such as furniture from residential and commercial premises. Your removalist will also need to know whether you require on-site inductions (safety training documents) prior to the removal. Ahh. Packing is probably the most… er… interesting part of any move. This is especially true of a commercial move because there’s electronic and IT equipment, paperwork and large heavy furniture to think about. If your workstations have data and power running through them, you’ll need an electrician to disconnect the power. Your building management should be able to recommend someone. Have you got any leased equipment such as a photocopier? You’ll need to contact the leasing company to check if the warranty requires that they move it. Often if you move leased equipment without the service provider’s permission you void your warranty. (b) the weight may exceed the limit allowed for the removal team to lift. This means on the day of the office move, the files will need to be removed and packed into boxes which may slow down the entire removal process. You may also think it’s unnecessary to clear pens, pencils and paperclips out of desk drawers. But they do need to be emptied and the contents packed into boxes and/or zip lock bags, because your removalist quite often stack desks and drawers upside down on top of each other for transit, and things could fall out. 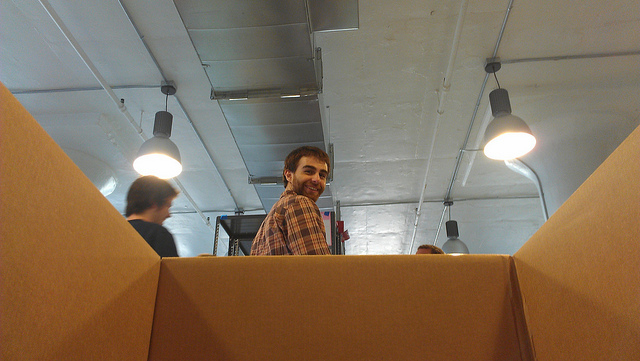 One of the easiest ways to make sure that all the boxes get to the right spot at your new office is to number them. After taping up a box, write a location/name/reference on tape on top of the box and not directly onto the cardboard. ALWAYS use a permanent marker on the tape as other pens will rub off easily. Then create a template by printing out the corresponding numbers and a small description on A4 paper. Place it in the area where you would like your removal team to place the boxes. A commercial move can seem very daunting. There are more aspects to consider in terms of logistics, paperwork (including legal documents) and packing requirements. It boils down to planning well – knowing what you need to do and getting it done with minimum fuss.